Since the beginning of filmmaking, the city of Paris has played an integral role in its development. It was, after all, where cinema was born—the Lumiere Brothers held the first public exhibition of a film in the basement of what is now the Hotel Scribe, located along a major boulevard in the Ninth Arrondissement. Indeed, the ideals of Parisian culture are instilled into the DNA of celluloid itself, and as long as the art form is around, the City of Lights will continue to be its gleaming capital. Naturally, this makes Paris a natural fit as a setting for a film that concerns itself with bringing back a sense of wonder and awe that has long since taken a back seat to blockbuster box office receipts and gimmicky fad “innovations” like 3D or High Frame Rate. This film is 2011’s HUGO, a love letter to the cinema from an unexpected, yet highly qualified, admirer—director Martin Scorsese. He’s done more for today’s cultural appreciation of film history than perhaps any other living filmmaker, which makes him the obvious candidate to tell a story about rediscovering the magic of film. Best known for his gritty, hard-hitting and hard-R rated urban crime films, Scorsese’s artistic aesthetic doesn’t seem particularly suited to a project marketed as an adventure for children, but ever since Scorsese’s young daughter Francesa gave him a copy of the source novel and expressed a desire for him to make it, not even he could deny his inspired appropriateness for the material. And so it was that Scorsese was hired by producers Graham King, Johnny Depp, and Tim Headington to direct HUGO from a script by his scribe on 2004’s THE AVIATOR, John Logan. As perhaps Scorsese’s most radically different work, HUGO holds an interesting place in his filmography as a critically-lauded, yet financially, unsuccessful film– but in the context of his late-era career, it becomes an intimate glimpse into the director as a young boy and the blooming of his own lifelong love affair with cinema. HUGO unfolds in 1930’s-era Paris, where a young boy named Hugo (Asa Butterfield) lives in an apartment carved out of the interior workings of the clocktower topping the Gare Montparnasse train station. He lives there alone, having lost both his father and uncle to untimely deaths, and he steals food and other items to scrape out a life for himself. One day, he picks the wrong man to steal from—the owner of a toy shop within the station, who seizes Hugo and doles out punishment by taking the boy’s prized notebook, which he carries everywhere and contains his father’s drawings and schematics for a broken writing robot (known as an “automaton”) that he’s been trying to fix. In a bid to get his notebook back, Hugo befriends the man’s goddaughter, a plucky young sprite named Isabelle (Chloe Moretz). To his surprise, he discovers that Isabelle is unknowingly carrying the last missing piece to the puzzle of the automaton—a heart-shaped key she’s currently wearing as a necklace. They use the key to bring the automaton back to life, and watch rapt as it begins to scrawl out a mysterious picture of a bullet slamming into an anthropomorphized moon’s agitated visage—an image that’s then signed with the name George Melies. Isabelle recognizes the name as belonging to her godfather, and so they start investigating his past only to discover that he was once a great magician and filmmaker who made hundreds of films, only to fall into ruin when the Great War broke up and devastated Europe. Armed with this knowledge, Hugo and Isabelle set about restoring Melies’ faith in cinema by trying to arrange a private screening of his last remaining work, A TRIP TO THE MOON (1902). Anchoring a Scorsese film is a tall order for anyone still dealing with the ravages of puberty, but child stars Asa Butterfield and Chloe Moretz more than capably deliver. As the precocious gearhead Hugo, Butterfield puts an interesting, unexpected spin on the classic “orphan pickpocket” archetype, while Moretz’s friendly and compassionate Isabelle provides a nice counterpoint to Hugo’s hardscrabble existence. The kids are surrounded by a group of extremely talented adults, many of whom have performed for Scorsese before. Ben Kingsley, who previously appeared as the head psychiatrist in 2010’s SHUTTER ISLAND, plays the legendary filmmaker/magician George Melies as a cranky, forlorn old man who has lost the creative spark. While Melies is a real-life figure, Kingsley reportedly chose to model his performance after Scorsese’s own personality instead. Emily Mortimer, who also showed up in SHUTTER ISLAND, plays a meek flower seller in the station named Lisette, and THE DEPARTED’s (2006) Ray Winstone plays Hugo’s Uncle Claude, a drunkard who’s vice propels him to his untimely demise. Jude Law, who had a bit role in THE AVIATOR as actor Errol Flynn, has another bit part in HUGOas Hugo’s father, a mild-mannered clockmaker with a voracious imagination. New to the Scorsese fold are Christopher Lee and Sacha Baron Cohen as Monsieur Labisse and the Station Inspector, respectively. Labisse is a kindly bookshop owner who lends books to Isabelle, while the Station Inspector is a bumbling, doggedly rigid lawman hobbled by his bum leg. Finally, Scorsese incorporates a couple playful cameos in the form of his BOARDWALK EMPIRE (2010) star Michael Pitt as a disgruntled projectionist for the Lumiere Brothers, and Scorsese himself as a photographer in a flashback sequence with Melies as a younger, successful man. Scorsese once again collaborates with regular cinematographer Robert Richardson, who won the Oscar for his efforts withHUGO. The film’s visual style is extremely important in the context of Scorsese’s career in that it marks a bold new foray into both digital acquisition and 3D. These two developments are directly related, as shooting digital was necessary to capture the footage in the new three-dimensional format championed by James Cameron and his blockbuster phenomenon, AVATAR (2009). The film is presented in the standard Academy aspect ratio (the first time Scorsese has done so since 1999’s GOODFELLAS), which leaves plenty of frame for the director to fill his practical green-screen compositions with the computer-generated vistas of a Paris long past. Indeed, the film comes across as very digital and artificial, almost like a storybook. In the hands of a lesser filmmaker, this approach would be offputting and unconvincing, but Scorsese finds a charming balance that encourages us to entertain the fanciful and allows us to immerse ourselves in the world. This digital set allows Scorsese to explore uncharted territory with camera movement, taking his penchant for extended tracking shots and giving him the means to design shots only possible in the virtual space. Two such shots bookend the film, starting out with the Parisian cityscape on a wide macro scale before gliding onwards with omniscient precision to a close up detail far in the distance (like Hugo’s eye peering through a hole in the clock face, for instance). 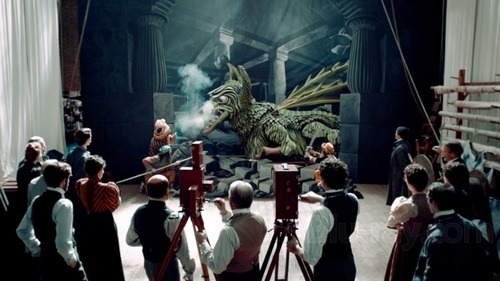 Scorsese already possesses a considerable reputation for virtuoso camerawork, but the technology afforded him during the production of HUGO allows him to re-conceptualize his entire approach to coverage from new, never-before-seen angles. In the process, he exhibits an unbridled energy that even filmmakers half his age struggle with attaining. 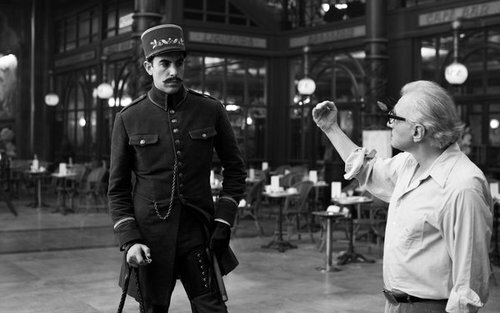 Returning production designer Dante Ferretti, who also won an Oscar for his work on the film, fills the industrial, labyrinthine Gare Montparnasse set with a fine layer of smoky haze and lots of churning gears, all rendered in bold color tones that confine themselves to a complementary blue and orange dynamic (similar to the bipack process that Scorsese incorporated in THE AVIATOR, except more naturalistic). Scorsese’s editing partner Thelma Schoonmaker blends all the film’s disparate practical and CG elements seamlessly, topping things off with a poignant tribute to celluloid itself in a swelling montage of clips from Melies’ actual films and other cornerstone works of silent film history like SAFETY LAST(1923) and 1903’s THE GREAT TRAIN ROBBERY (the last shot of which serves as the source for an homage Scorsese placed at the end of GOODFELLAS). Howard Shore once again reteams with Scorsese to create HUGO’s soundtrack, which swells and flows through the entirety of the film like a coursing river, albeit one with a distinctly Parisian flair thanks to the recurring use of an accordion. While the 1930’s setting doesn’t allow much opportunity for Scorsese to throw in a Rolling Stones track as per his signature, he employs a few needledrops in the form of opera and the modern classical piece “Danse Macabre” by Camille Saint-Saens, which is generally regarded as the earliest song ever commissioned for a film’s soundtrack. 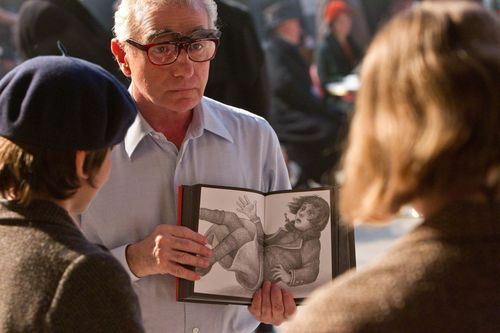 HUGO contains many of the thematic hallmarks of Scorsese’s work, like hardscrabble, disadvantaged protagonists who resort to crime as a means to live, detailed depictions of street life (the train station in particular serves as a contained social ecosystem), and the Roman Catholic imagery of popes and monks scattered throughout the landscape in the form of cold, imposing statues. Most of all, HUGO speaks to Scorsese’s lifelong affection for the cinema, a love that drives every frame and camera flourish with an endless energy. The film dedicates large portions of the story to cinema’s profoundly emotional affect on the characters. The fact that the film is set in the city of cinema’s birth makes this aspect of Scorsese’s approach all the more poignant. The idea of film preservation, another avenue of the art form that Scorsese had dedicated his career to, makes a strong case for higher visibility in HUGO when Scorsese shows us the tragic development of Melies’ beloved films boiled down and destroyed because the raw chemicals from the celluloid were deemed more valuable than the images they contained. In Scorsese’s eye, this is a great crime toward humanity akin to the burning of the Great Library of Alexandria—countless works of art and knowledge become lost forever if we don’t take the necessary steps to safeguard and preserve them. Scorsese’s love letter to cinema was well received by critics, who couldn’t help but be infected by the director’s unconditional affection for the art form. While this reception unfortunately didn’t translate to strong box office, it did result in several Oscar wins for its cinematography, art direction, sound design, sound mix, and visual effects. In his first large-scale experience with digital cinematography and the 3D format, Scorsese proves himself more than capable of adapting his craft to new technologies, lending firm evidence to the notion that a film’s strength is attributable to its author and not the particulars of its production. Some will find great irony in the fact that the movie wasn’t shot on the celluloid film it places so much celebratory emphasis on, but to dwell on that aspect is to miss the point of Scorsese’s message entirely. HUGO is not a celebration of film… it’s a celebration of cinema, and cinema will endure long after the last rolls of celluloid are exposed to the light. HUGO is currently available on high definition Blu Ray via Paramount.